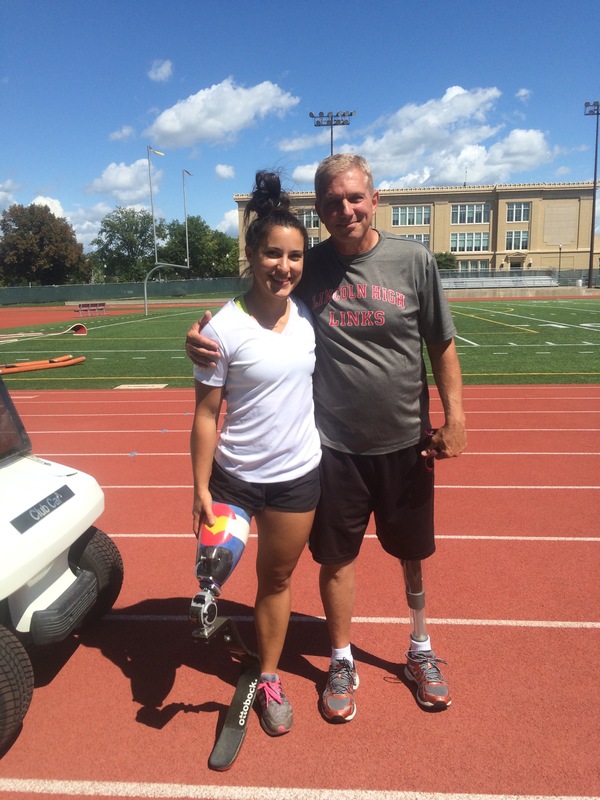 This August I had a quick stop in Lincoln, Nebraska to work with my Ottobock family instructing another running clinic with some super star amputees. The particular gentleman I’m sharing with you all is Bob White. He is the athletic director at Lincoln High School, and just an over all super-nice guy. A USATF official bolted towards me, and boy, I was ready to THROW-DOWN (mostly because I wasn’t supposed to be in the sports-med area, and I just didn’t feel like leaving since I was probably in trouble) I was wearing shorts, and this meet worker starts asking about my leg. Before I know it, he is lifting up his pant leg comparing his prosthetic to mine and asking how and why I did so well. I gave him all of the info about the C-leg I’m wearing, and fast forward to this Lincoln trip, Bob the USATF official, made a big change to his very own C-leg. He is doing awesome. It was so cool to have a moment like this, where my life had connected to very different, but also very similar moments to create a full circle. Bob helps elite athletes at one of the highest profile track meet (arguably in the world) and here he came, a little nervous, but excited to try and run for the first time in 7 years. He wants to keep up with his own kids he coaches and it was my pleasure to get him up and going. We laughed and worked on drills and it was truly an honor and a gift to work with Bob. Bob you da best! Going into my preseason workouts, gearing up for 2016, Bob is now my inspiration. The emotional and physical come down from high profile track meets, like the World Championships is never easy. Getting back on the horse isn’t a fun ride either. Returning to training sometimes has you feeling like a baby giraffe learning to walk again, all aloof with these appendages that are supposed to help you succeed. Bob was truly a kind and positive influence on me. I may have helped him run again but it is him, and the many people like him whom I have the honor to meet, that keep me running.